The preliminary investigation revealed that a 2007 Mazda sedan, occupied by only the driver, was travelling west on Mountain Road, ran off the right shoulder of the roadway and struck a tree. 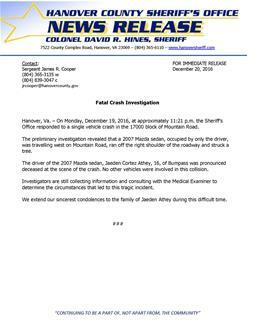 The driver of the 2007 Mazda sedan, Jaeden Cortez Athey, 16, of Bumpass was pronounced deceased at the scene of the crash. No other vehicles were involved in this collision. We extend our sincerest condolences to the family of Jaeden Athey during this difficult time.